The content you've created or imported from Curriculum Groups is stored here. All stored content may be edited for your use. The units, lessons, and assignments you choose to publish will be viewable by your students and their parents. The Add Content option can be accessed via the Classroom Curriculum. After clicking Add Content, choose the type of content you wish to create: unit, lesson, or assignment. Units can contain lessons and assignments. Notice that units have two parts: Student View and Instructional Plan (for your eyes only). Add content to the unit using the text icons at the bottom and click Publish when ready to share with your class. Lessons can contain assignments. Again, notice that lessons have a Student View and Instructional Plan. You may publish a lesson without publishing the assignments within the lesson. Assignments are published per course, and everything in an assignment is visible to students. Organize: drag and drop content to nest units, lessons, and assignments. New content will automatically appear at the top but you can move and reorganize any assignment, lesson, and unit in any order you prefer. Drafts: if you are not ready for students or parents to view your curriculum, you can save a draft. 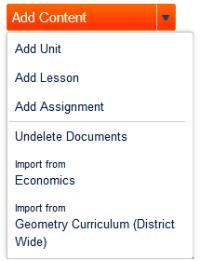 Drafts are only visible to you and draft assignments do not display in the Gradebook. You can edit drafts and publish when you are ready to make them visible to students and parents. All chosen types of content will be added and can be edited. For more information on Curriculum, visit Editing Content in Curriculum Groups and Adding More Modules to Your Curriculum Content.